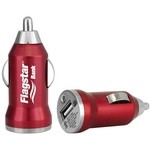 Drive your business to the forefront of peoples’ minds with a car charger branded to include your company logo. With a universal adapter, users can power any device – from cell phones to laptops and music players – all while on the go. Transform a car dashboard into a hub for charging devices while simultaneously endorsing your services. Customers of ePromos receive access to thousands of products through our online catalogue, which features the hottest gadgets and promotional merchandise in the industry today.